Noodles & Company GIVEAWAY! | The Food Hussy! I love the folks at Noodles & Company - they're always sending me info about their new dishes along with free bowls for me and you! So - free lunch for me and Lar and free lunch for one of you! This time we even got a free t-shirt and reusable tote. 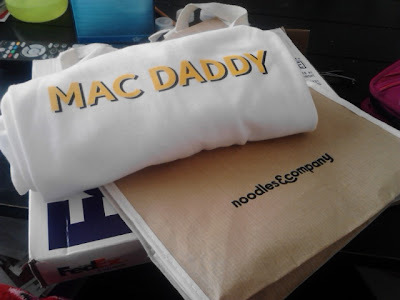 Larry was more than happy to take the t-shirt and wear it to the gym - he's a mac daddy - of course! He went for the mac & cheese in honor of the shirt with a grilled chicken breast on top. He loves their chicken. He's a big eater but we're always surprised at how filling their "regular" size is. We both probably could have gone with the "small" but this way we had leftovers. 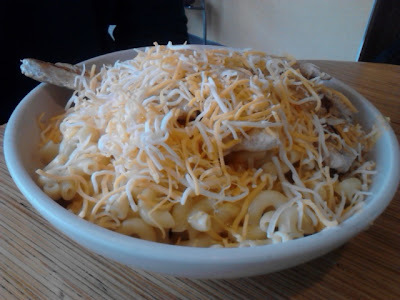 He also likes all the shredded cheese they put on top - it's a good mac & cheese for sure! 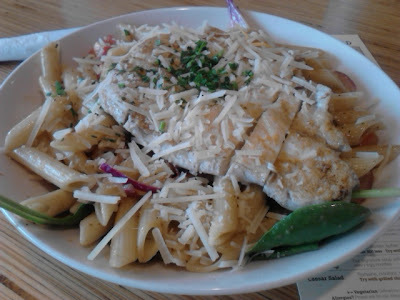 I tried the Pasta Fresca with a grilled chicken breast. It was really good. Penne with balsamic, olive oil, white wine, roasted garlic, red onion, tomato, spinach and parmesan. Larry's choice was under the "American" menu and mine was under the "Mediterranean" but I have to say - the "Japanese" has a lot of inviting choices as well. Plus they now have sandwiches - which might have to be my next choice! So they have 5 sandwiches: the Meatball, the Med, Spicy Chicken Caesar, Wisconsin Cheesesteak and Veggie Med - let me know in the comments which one you'd like to try as well as a way to contact you (email, facebook or twitter) and you might win! 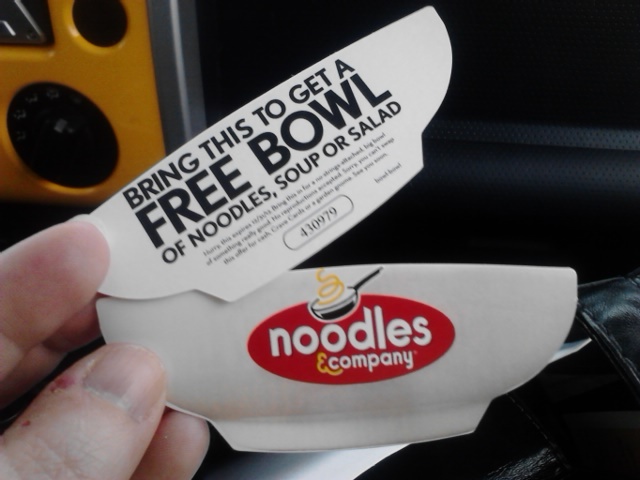 Thanks again to Noodles & Company for the free bowls and the coupons for you guys! Thanks for the great giveaway FH!